The purchase of 61.6 acres in Hatchville from the Dupee family in 2002 was another step in the town’s efforts to preserve land on Coonamessett Pond and the Coonamessett River. The Dupee property is bounded by Sandwich and Hatchville Roads and the Coonamessett River. Frontage on the pond offers a small beach for swimming. The property connects with the Matt Souza Conservation Area and, across Hatchville Road, town-owned cranberry bogs and The 300 Committee’s Toner parcel. Although the property is dense with trees and an understory of briars and huckleberry, the foundations of an old dairy barn and silo serve as a reminder of the large dairy farms that dominated Hatchville in the last century. Atamannsit Road, the private lane that leads to the houses along Coonamessett Pond, takes its name from one of the leading dairy farms. 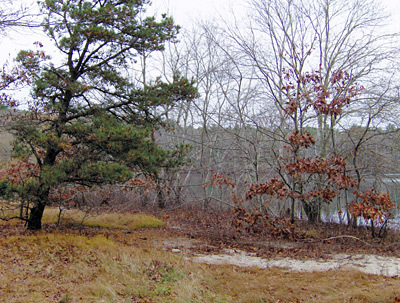 In 2005, the Falmouth Conservation Commission and The 300 Committee prepared a management plan for the Dupee land, which included the creation of a trail system. Trails are accessed from the nearby Matt Souza Conservation Area, with parking at the entrance. There are two trails leaving from the parking area. One is to the north and parallels Matt Souza. It is hilly and has several loop choices. Finding the entrance to the second trail requires more attention. It is blazed and heads east out of the parking area for a short distance to end on Hatchville Road. Turn left onto the road, pass Atamannsit Road, then pick up the trail where it heads north from Hatchville Road. This is a meandering trail that ends at a small beach area on Coonamessett Pond. In the winter of 2014, 300 Committee volunteers and a crew from AmeriCorps Cape Cod did extensive clearing work to expose the foundations of historical structures on the Dupee property. The adjacent meadow was also opened up, with the removal of invasive species, to increase the diversity of habitat on the conservation land. 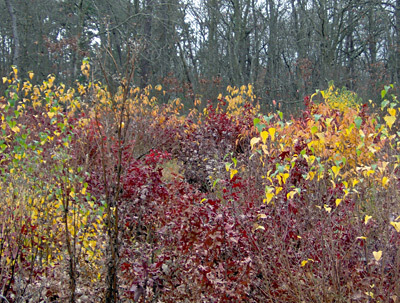 Fall colors at Dupee parcel. Dupee Parcel at the southern end of Coonamessett Pond.